This is strathclydes new arp, its two appliances in one. Added by Steve bonner on 06 February 2006. That is a very big fire engine.... Do you have more information about this vehicle ??? Added by Marcel Sloover on 06 February 2006. Added by Nathan Smith on 24 June 2006. Not liked appliances at any of the stations that have them in SF&R. They are neither a good WRL or a high reach appliance, would be much better with a dedicated machine for both jobs. They are also very slow in both driving speed and boom operation. Added by James Baxter on 25 November 2006. If anyone has some information and specifications on this appliance and would be willing to pass it on to me, as our station are about to receive one. 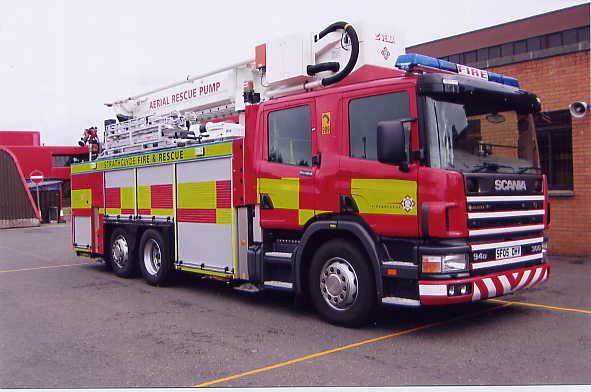 Added by Ricky Bateman on 07 February 2007.
i don't know much firetenders but this seems a good idea how long has it been in service it looks a nice machine just the same. Added by Eric Haddow on 07 February 2007. I prefer if this appliance is installed with snorkel/hydraulic platform. Added by Bomba995 on 08 February 2007.
quite funny in a way that a lot crews from SFRS don't like them. we heard SFRS is reviewing these machines whilst our brigade L&B is looking at buying a few! Added by Stevie Murray on 16 February 2007. I saw one on the back of a low-loader been smashed up week before last heading down south. Anyone know what happened? I hope the crew were OK, OIC wouldd have had a shock as windsreen shattered. I know crews didn't like them but thats taking it a bit far!! Added by Mick Pegg on 04 September 2007. Too big, tall, long, how will they fit retained stations when it becomes a hand me down, they topple over, what happens when they need a service ? do you get spare appliances ? we had these 30 years ago and they werent a good idea then, a huge waste of money !! Added by Big Al on 07 October 2007. Added by Peter Williams on 07 October 2007. I was on this one when it rolled over at slow speed going around a roundabout in Hamilton on 20th May 2007! It doesn't look as good as this now...... in fact, they are totally unstable and dangerous; the FBU know about that!! Added by Stevie Aitchison on 26 January 2008. ....yip, and the fbu ain't doin too much about it. does anyone know whose side they are on anyhow....?? Added by Stevie on 20 February 2008.
picture #1458 and picture #3188 have pretty heavy discussions going on, about these "Quints". In North America, the builders have longer and wider chassis' to mount all this gear on; as most communities are much newer than in Europe and consequently have much wider street lay-outs. The few older communities have been mostly "improved" by Great Fires and/or Urban Redevelopment. As Big Al says, while a CARP/Quint is very tempting for a Town/City interested in its first Aerial; they must make sure of a back-up - either getting an older Aerial at same time, or ensuring that a neighboring community has one available on Mutual Aid. Added by Pat_R-B on 09 June 2008. Added by Colin richards on 28 October 2008. .....i would like to put my own (copyrighted) pictures of this very same arp on this site, taken on it's very last day in service; that's the picture of it's very last day as a frontline fire fighting vehicle showing the damage for it to be written off, you know the one where it's lying on its side as it was going around a roundabout on its way to a fire call......would like comments on this please......the ball is starting to roll!! Added by Stevie on 30 October 2008.
i just turned this page on its side, , , looks more natural!! Added by Big Al on 30 October 2008. Please add your pics, might be worth whilst going public with this too! Added by John Johnstone on 30 October 2008. ....it'll be in the public domain just shortly!! Added by Steve B on 30 October 2008. The initial purpose for developing Quints in the USA was to reduce staffing -- specifically in St. Louis Fire Department. When the machines were introduced about 1/3 of the workforce were lost to early retirement, attrition and a few layoffs. The concept was intriguing and many cities, towns and rural departments followed the lead. Here's the hitch: Here in the USA the pumper and aerial (usually totalling 8 firefighters) have two very differing job assignments. Problem is, an arriving quint has 4 members aboard, and its the ladder task that usually suffers. Added by Lou Angeli on 01 November 2008. Quints work in the volunteer service b/c it gives the capability of two apparatus in one where you never know what apparatus or how many personnel may show up. Plus as has been pointed out, it works better in the US b/c the are longer and wider, thus a lower center of gravity. Compare this pic to some of the quints from US manufacturers. Added by R. Genberg on 01 November 2008. Thank you RG for providing the volunteer perspective. I'd be curious to learn if the Fire Brigades Union has taken issue with these multi-task appliances? Added by Lou Angeli on 02 November 2008. Stevie you got those pics up yet? Added by Steve B on 08 November 2008.